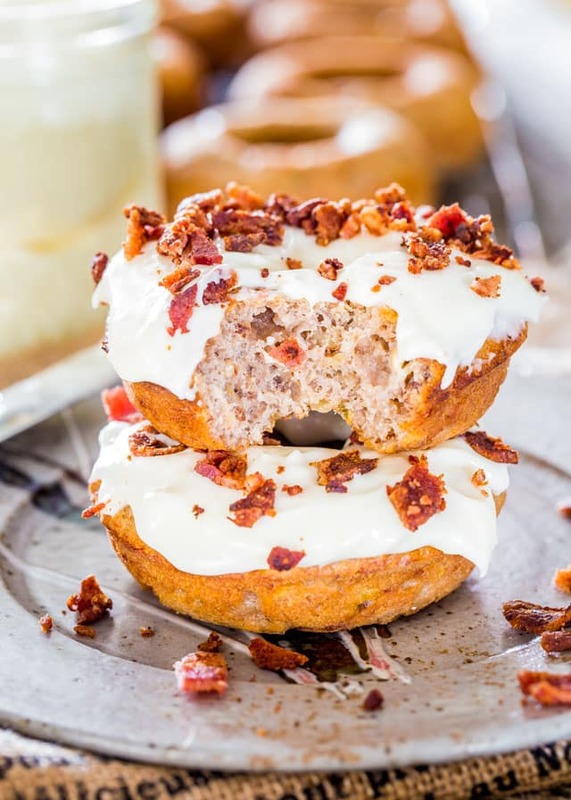 The Porky Monkey Donut – baked banana nut bread donuts iced with maple cream cheese icing and topped with bacon. ‘Nuff said! With a recipe name like the porky monkey, this can’t be a very serious post. So I apologize in advance if I say anything stupid. But what a fitting name for such a donut and I can’t take credit for it. The other day I was watching “You gotta eat here” on the food network channel and one of the places they were visiting was a donut place that served all kinds of crazy good donuts. Needless to say that by the time that show was done I was craving donuts like crazy. One of the donuts featured was the porky monkey which was a banana bread donut with cream cheese icing and bacon. This donut really spoke to me, and I said to myself, “Self, I can do this!”. So here I set on a journey to make my version of the porky monkey. My banana bread donut has nuts in it and it’s baked, so by that definition alone, this is a healthy donut! And I think I’ve established before that bacon is a vegetable. Don’t argue with me! Let me just say I had fun making these donuts. At first I wasn’t sure if I should make a batter or a dough, if I would have made a dough I would have definitely fried the donuts, but since I made a batter I baked them, because I care about you guys. I have to say the banana nut bread donut recipe is pretty similar to my banana nut bread recipe, perhaps the donuts have a bit more flour and less sugar. I also used apple sauce instead of butter. You’re welcome! 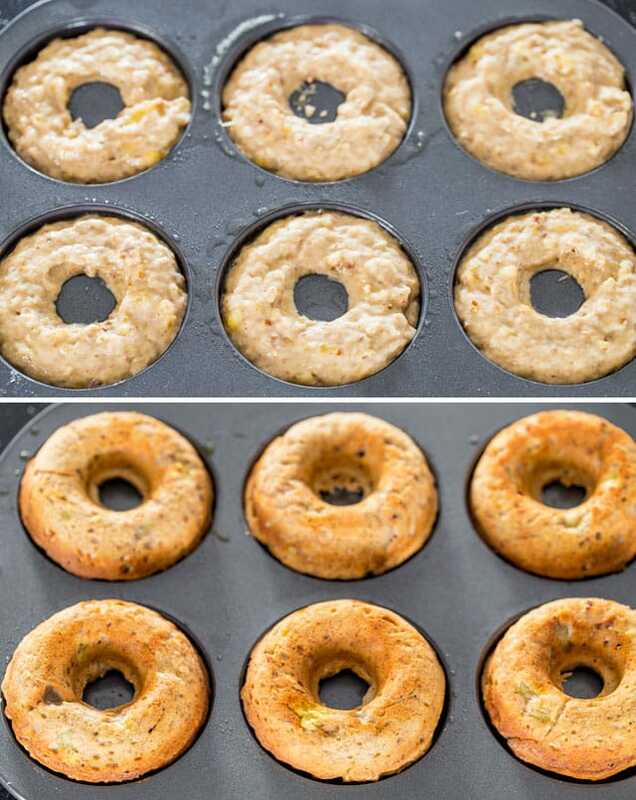 You will need a donut pan to make these donuts, but if you don’t have one and don’t feel like spending the ten bucks to buy one, just use your muffin tray and make mini muffins instead. You can still call them porky monkeys. Nobody’s judging here. Like I was saying a pretty healthy banana nut bread donut. Let’s just go with that because from here on we’re going to the dark side. Now I just love love love a good cream cheese icing, and this icing is flavored a bit with some maple syrup. So you see how I Canadianized these donuts? But yeah this is a crazy good icing. After you let your donuts cool, patiently, you can slather them with that delicious icing. By the way the recipe for the icing below makes about double the icing you’ll need, just keep the extra in the fridge for those rainy days. And now comes the fun part; BACON! 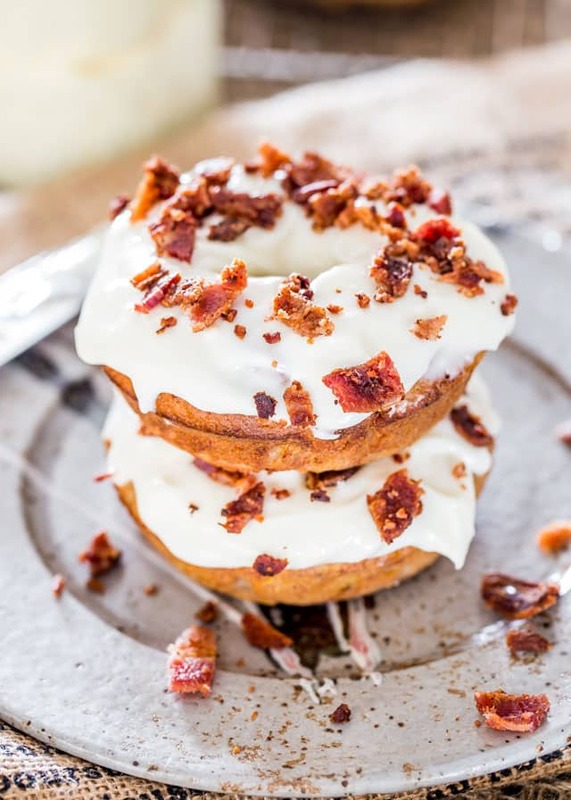 I told you bacon makes the world go round, and bacon on a donut is a dream come true. When you first take a bite into this donut, and trust me when I say you will not be able to just stop at one donut, even though you’ll feel your pants bursting, but when you take your first bite, you’ll roll your eyes backward and have a foodgasm. And if you want to go a bit nuts, take that maple syrup and drizzle it all over your donut! 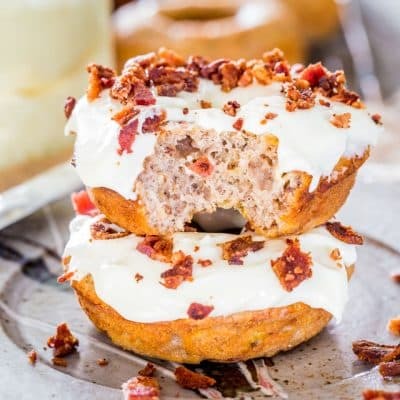 The Porky Monkey Donut - baked banana nut bread donuts iced with maple cream cheese icing and topped with bacon. 'Nuff said! Preheat your oven to 375 F degrees. Spray a donut pan with cooking spray. In a large bowl mash the bananas with a fork or a potato masher. Once the bananas are mashed, add the brown sugar, apple sauce, eggs, vanilla, salt and whisk it all together until all the ingredients are well incorporated. Add the baking powder, flour and chopped pecans and with a wooden spoon mix everything together until well incorporated. Pour the batter into a large ziploc bag or piping bag. Squeeze all the batter to the bottom of the bag then twist the bag to keep the batter moving towards the bottom. Using your scissors cut across one of the corners to create the tip, it should be about 1 inch in diameter. Pipe the donut batter into each donut mold. Bake the donuts for about 20 to 25 minutes until golden brown. Remove the donuts from the donut pan onto a cooling rack and let them cool completely before icing. In the mean time make the icing. Into your mixer add the butter, cream cheese and maple syrup. Mix everything together until the mixture is smooth, about 3 minutes. Add the salt and the icing sugar. Slowly start up your mixer again and mix until all the icing sugar is incorporated into the cream cheese. 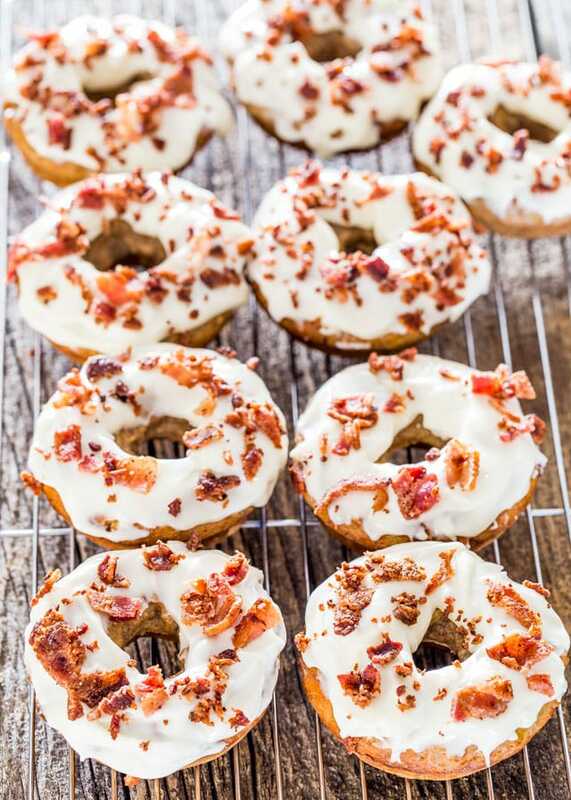 Spread some of the cream cheese icing onto each donut, then top with chopped bacon. The applesauce can be substituted with melted butter. Recipe for cream cheese icing is double what you need for these donuts. Store the leftover icing in air tight container in the fridge for up to 2 weeks. Mm tasty! Is apple sauce in any way, replaceable by another product?